Any and all Jewish teens are invited to join the Summer Mifgash (Encounter) Adventure! This project brings together Israeli and American Jewish teens for day-long bus adventures here in the Bay Area. It’s like a week of Jewish camp, but at home! Local Jewish teens will host and/or travel with Israeli teens from the Mosenson Youth Village High School in Hod HaSharon, Israel. Destinations include San Francisco, 6 Flags, Monterey, Silicon Valley, an overnight retreat and more. This adventure is designed to bond the teens and deepen their Jewish identity. It offers a fun and unique way to engage Jewishly. Teens can choose to participate for the whole week, or for individual day-long adventures. 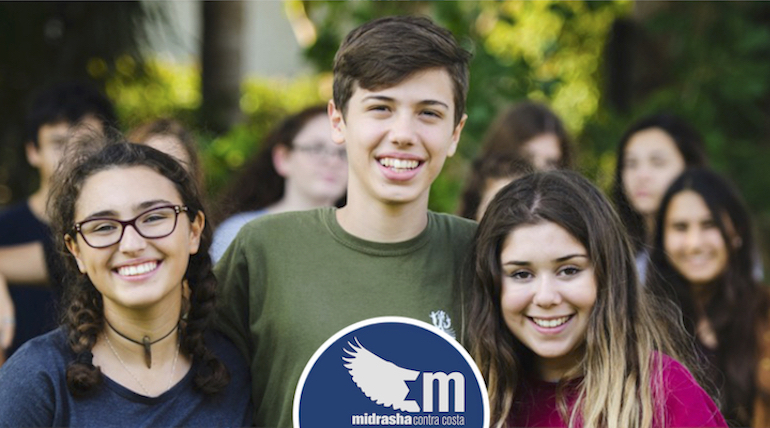 RSVP to host an Israeli teen and/ or to register your own teen in this exciting adventure: ccmidrasha.com/mifgash. This project is part of the Jewish Teen Education and Engagement Initiative, with support provided by the Jewish Community Federation and Endowment Fund, Jewish Federation of the East Bay and The Jewish Community Foundation, and the Jim Joseph Foundation. Additional underwriting provided by the Contra Costa Jewish Community Center. Sponsors: Contra Costa Midrasha, Contra Costa JCC, Cong. B’nai Tikvah & Cong. B’nai Shalom.